Neutron is an advanced music player with close-to-metal 32/64-bit audio engine which delivers the best possible Hi-Fi grade quality of sound on your Android device. Neutron offers high-resolution audio playback without frequency resampling and bits truncation if internal/external DAC supports it (passes by Android's format limitation!). Thanks to input/output network capabilities Neutron is the only application in the market capable of sending audio to the network renderers (UPnP/DLNA, Chromecast) with all DSP effects applied including true gapless playback. It features the sophisticated UI with advanced options and controls for music playback. It is not an easy or another 'pop' music player, it is developed for audiophiles and those who really in love with music! 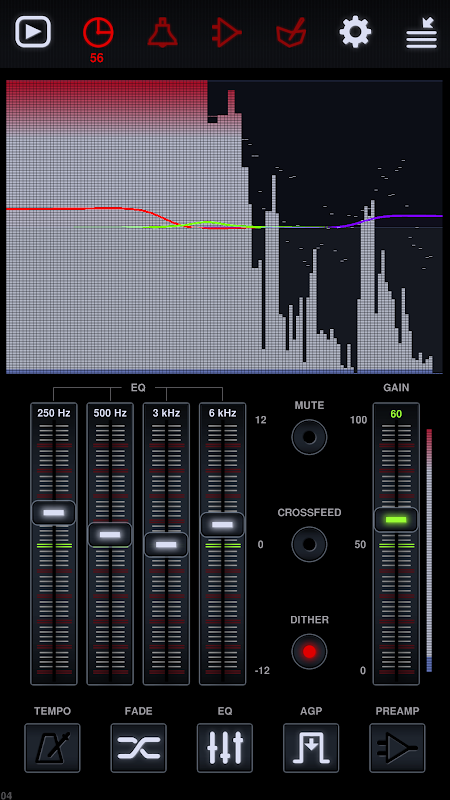 * 32/64-bit audio processing (HD audio). * OS and platform independent decoding and audio processing. * Hi-Res Audio support (Android 4.4+, >= 24-bit, up to 768 kHz): - devices with on-board Hi-Res Audio DACs - DAPs: iBasso DX150-DX200, Cayin i5-N5ii, Fiio X5-X7, HiBy R6 (+PRO) * Bit-perfect playback. * Audio formats: MP1, MP2, MP3, OGG (Vorbis), FLAC, OPUS, WMA, WMA Lossless (16-bit), AC3, AAC, M4A, M4B, M4R, MP4, 3GP, 3G2, MOV, ALAC, APE (Monkey's Audio), WV (WavPack), MPC (MusePack), WAV, AU, AIFF, MPG/MPEG (audio), AVI (audio), iTunes/Windows Media (non DRM). * Native DSD (direct or DoP), DSD. * Decoding DSD to PCM. * Module music formats: MOD, IM, XM, S3M. * Voice audio format: SPEEX. * Playlists: CUE, M3U, PLS, ASX, RAM, XSPF, WPL. * Lyrics (.LRC files, metadata). * Streaming audio (plays Internet radio streams, Icecast). * Supports large media libraries. * Network music sources: - SMB/CIFS network device (NAS or PC, Samba shares); - UPnP/DLNA media server; - FTP server; - WebDAV server. * Output to Chromecast (up to 24-bit, 192 kHz, no limit for a format or DSP effects). * Output to UPnP/DLNA Media Renderer (up to 24-bit, 768 kHz, no limit for a format or DSP effects). * Direct output to USB DAC (via USB OTG adapter, up to 32-bit, 768 kHz). * 32-bit output on Android 5+ (IEEE 754, optional). * UPnP/DLNA Media Renderer server (gapless, DSP effects). * Device local music library management via internal FTP server. * DSP effects: - Parametric Equalizer (4-30 band, fully configurable: type, frequency, Q, gain); - Graphic EQ mode with 21 common presets; - Surround Sound (Ambiophonic R.A.C.E. ); - Crossfeed (better stereo sound perception in headphones); - Compressor / Limiter (compression of dynamic range); - Time Delay (loudspeaker time alignment); - Dithering (minimize quantization); - Pitch, Tempo (playback speed and pitch correction); - Phase Inversion (channel polarity change). * Speaker overload protecting filters: Subsonic, Ultrasonic. * Normalization by Peak, RMS (Preamp gain calculation after DSP effects). * Replay Gain from metadata. * Gapless playback (sample accurate). * Hardware and Preamp volume controls. * Crossfade. * High quality real-time optional resampling (Quality and Audiophile modes). * Real-time Spectrum and RMS analyzers. * Balance (L/R). * Mono mode. * Playback modes: Shuffle, Loop, Single Track, Sequential, Queue. * Playlist management. * Media library grouping by: album, artist, composer, genre, year, rating, folder. * Artist grouping by 'Album Artist' category. * Folder mode. * Clock mode. * Timers: sleep, wake. * Interface languages: Русский, 中文 (繁体), 中文 (简体), 한국어, 日本語, Việt, ไทย, Deutsch, Italiano, Indonesian, Malay, Nederlands, Français, English, Español, ελληνικά, Português, Magyar, Polski, العربية, Türk. NEON optimized APK for 32-bit ARMv7 CPUs (>25% faster, not required for 64-bit ARMv8 CPUs): http://neutronmp.com/downloads Evaluation version: http://play.google.com/store/apps/details?id=com.neutroncode.mpeval E-mail: neutronmp@gmail.com Forum: http://neutronmp.com/forum Please report bugs directly by e-mail or via forum.  Is Neutron Music Player yours? Claim it!